Videos give us a much more lively and vivid impression than photos can do. The tone alone makes a big difference and the moving pictures look much more realistic than a photo. Therefore it's quite tricky to make a film, much more than photographing. That's why professional movie makers have a considerable budged and a staff. Asienreisender does not have that. This here is neither Hollywood nor it's Bollywood; it's not even Nollywood. But the movie(s) show authentic impressions one seldom get's elsewhere, and are quite unique. Welcome to Asienreisender's no budged videos! By the way: the reasons why this section is yet quite neglected are simply that making videos is first very time-consuming and, second, I still have no video programme I am really confident with. I hope, that will change in the future, because there is plenty of material in the drawer. The film describes a two days journey downwards the Mekong River from Houayxay in the north of Laos to Luang Prabang, an ancient, a bit mystical town with a longer history of regional importance. Do you want to see a really 'real' Tyrannosaurus rex in action? 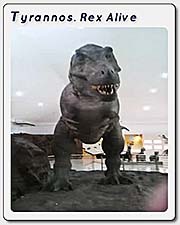 There is one left in the Fossil Shell Museum in Nong Bua Lampu - it's a hydraulic model of a dino who looks at least really convincing. I have heared of kids who ran away from it, and that's understandable. In the Areng Valley of the Cardamom Mountains live some 1,500 or so people of the Chong and Phor tribes. They are Khmer People, but went up into this remote part of the mountains some centuries ago to escape enslavement by a Siamese army. They follow animist believes. 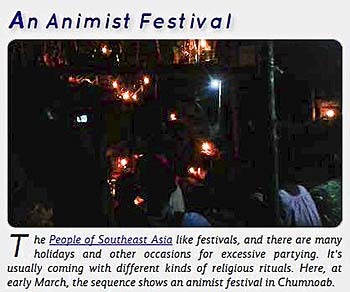 The video shows a sequence of a tribal festival in Chumnoab, a hamlet in which these people lived for generations relatively isolated from the outer world. Videos in the internet have developed considerably in the last years. Particularly 'Youtube', which was limited in the past for films up to ten minutes only, provides nowadays videos of all kind, some of them are two or three hours long. Here and there they make an excellent addition to the articles on this website. Also many cinema movies and other documentaries, some of them are rare, have influenced this webproject. This movie is a documentary about the orangutans in the 'rehabilitation center' in Bukit Lawang / Sumatra. It shows the destruction of the tropical rainforest by timber companies, the rescue of some orangs by a Swiss team and the new life of the charming animals in the forest around Bukit Lawang.